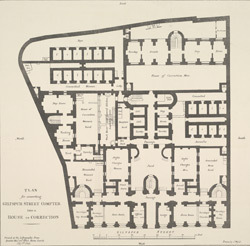 This plan was produced with a view to the conversion of Giltspur Street Compter into a Prison. The plan's title and imprint are at bottom left, with scale bar at bottom centre and orientation points marked on margins. Built by the sheriffs as a prison for debtors, Giltspur Street Compter began to receive inmates from Wood Street Compter in 1791. It was demolished in 1854.